Book now! 2 more spaces available for July 2019! My daughter Louisa spent one month at this amazing camp and met another Russian girl her age from New York City. Louisa loved the excellent French instruction/horses and went to so many excursions. The beach riding and the weekend in Bruges as well as castle of Veves were some of the highlights. I would definitely recommend this camp! What a wonderful camp! I really can't say enough good things about it. The girls had so much fun riding horses and had a chance to interact with girls from other countries. It was a great international experience. The excursions provided a great opportunity to learn about history and Belgian culture. Bruges was amazing, and the chocolate museum was a big hit with the girls. Learning French through immersion is really the best way to learn a language, and this camp added another element -- fun. 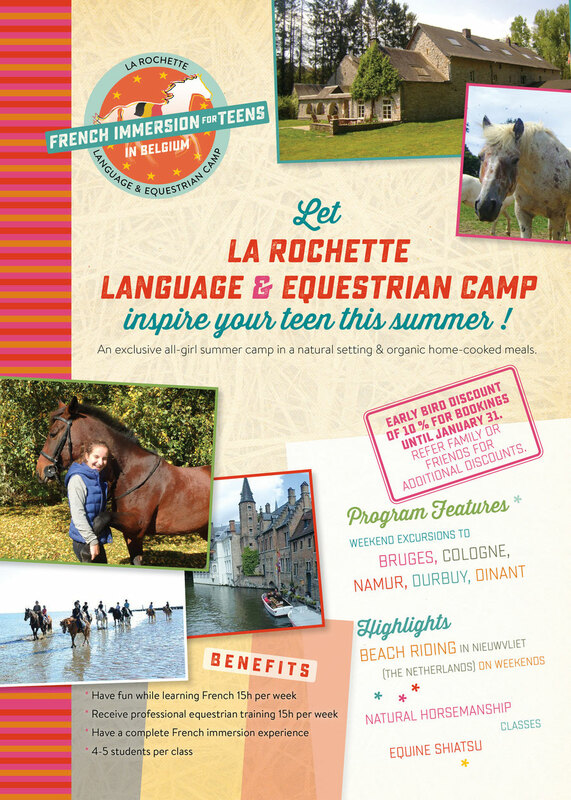 La Rochette Summer Camp is a new extension of our existing business La Rochette Conference Services, subdivision of Presenta Sprl established since 1995. Our company Presenta Sprl is member of the Belgian export club AWEX.